Premiered on CPTV in June 2018 — Stream the Film In Its Entirety Above! 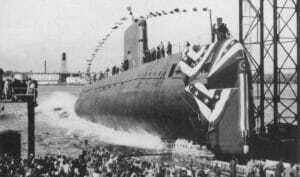 Barnes springs were used to build the world’s first nuclear submarine, the USS Nautilus. From clocks to hoopskirts, typewriters to bicycles, Barnes Group Inc. has been at the forefront of innovation in Connecticut and the world for over 160 years. Founded in 1857 by Wallace Barnes in Bristol, CT, the company has manufactured springs for countless products for generations. The company’s history and deep impact on global manufacturing is explored in The Barnes Way. The film also considers how Barnes products followed the trajectory of major scientific breakthroughs; their products were in the USS Nautilus submarine, John Glenn’s space suit, and the Mars Rover. Interviews with three generations of Barnes family members, former employees, and top managers highlight how the family-run company grew to world prominence and became a major player in the manufacturing and aerospace industry, while never forgetting its roots in the Constitution State. Arno Pfaff, director of corporate sales at Männer, shows off one of the company’s high-tech machines. 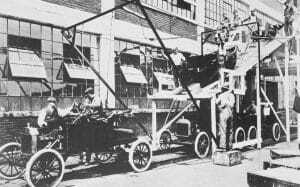 A Ford assembly line, where Barnes parts were used to make automobiles.